September 25, 2015 Posted in Bakings, Food, Snacks, Starters. I love to take walks to forests and I really like mushrooms so it is cool that mushroom time is here again. Last weekend I headed to pick mushrooms together with a friend and two crazy dogs. We got lots of fresh air but not that many chanterelles (=suppilovahvero). Still just enough for these lovely appetisers. When it comes to mushrooms I like to keep it simple so the taste of chanterelle is strong, like in these chanterelle breads. Chop onion and tear chanterelles to smaller pieces. Melt butter in a pan. Fry onions first at medium heat, add chanterelles and fry until the moisture gets out from mushrooms and they become nice and firm. Season mushrooms with salt and pepper. Slide chanterelles and onion to other side of the pan and toast the bread slices in the same pan. 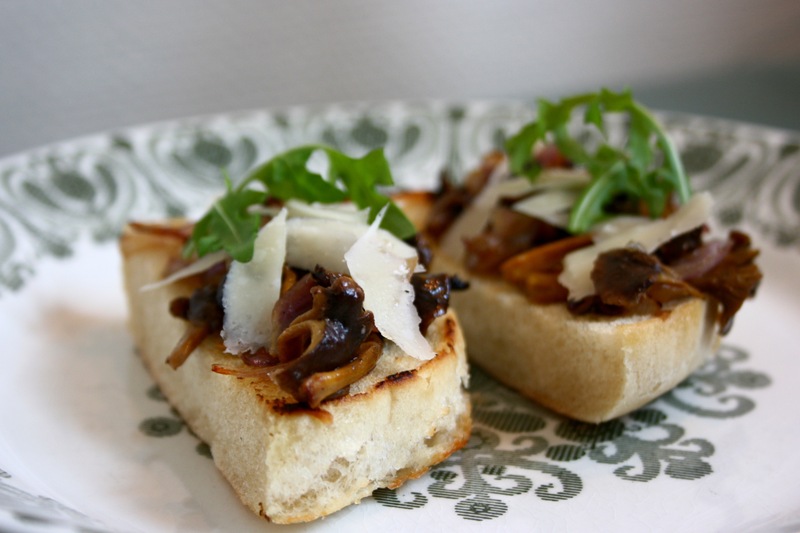 Cover toasted bread slices with filling, slice parmesan cheese and add it with arugula on top. Enjoy!